How Quickly Can Bedsores Develop on a Nursing Home Patient? 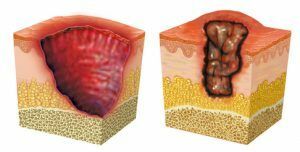 Decubitus ulcers, commonly referred to as bedsores or pressure ulcers, develop in individuals that are chair bound or bed bound for an extended period. Many ulcers begin forming in as little as a week when lying or sitting in the same place. On average, bed sore developing skin ulcers become serious in less than a month of being bound to a chair or bed. Bedsores on the skin are caused by continuous pressure and irritation at any specific location on the body. However, bedsores tend to be common on a prominent bony area including the buttocks, hips, elbows, back of the head, shoulders, lower back and heels. Bed sores can be minimized when taking preventative measures including changing body position whenever possible to relieve pressure. Decubitus ulcers often appear in various stages depending on severity. Medical care identifying or grade the sore, based on the depth of the ulcer. Grade #1 – The patient’s skin appears permanently red but has no crack or break in the surface. Often times, the area feels warm and hard to the touch, and slightly swollen. Individuals with dark skin often have bedsores that are blue or purple in color. Grade #2 – The bedsore appears superficial much like an abrasion or blister. Grade #3 – The decubitus ulcer penetrates throughout the entire thickness of the patient’s skin where obvious damage appears in underlying tissue. Grade #4 – This type of ulcer is the most severe, where the sore is deep with significant damage to the bone and muscle beneath. Anytime a bedsore is neglected in a hospital, nursing facility or assisted living home, it can be life-threatening. Many victims of abuse or neglect can develop an infection that can easily spread to the bone, heart and blood. Serious neglect of the decubitus ulcer can lead to amputation or autonomic dysreflexia (overactive autonomic nervous system). Placing a loved one in a nursing home for necessary care requires a level of trust. Unfortunately, whenever the trust is violated, the love one can suffer a variety of serious injuries including debilitating bedsores. When this happens, it is important that family members hold the nursing home accountable for their negligence and abuse. The legal team at Nursing Home Law Center LLC at (800) 926-7565 is experienced in nursing home negligence cases involving serious injuries. We offer free consultations to evaluate the circumstances surrounding all treatments or lack of treatment to assist in obtaining financial compensation for your loved one.